Experience the songs, sketches and comedy live! 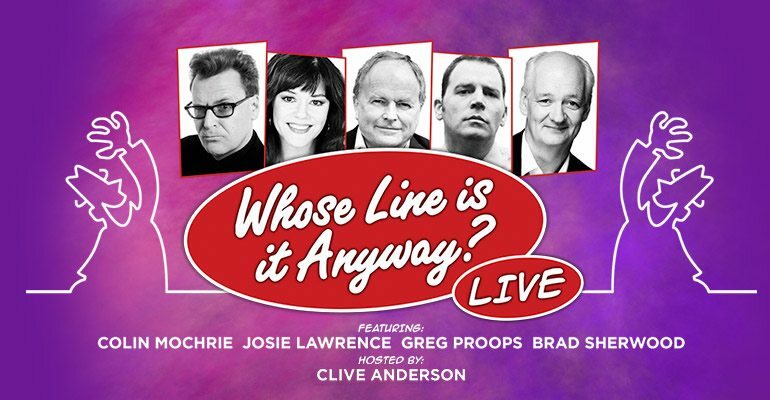 Smash-hit 90’s television show Whose Line Is It Anyway? returns to the West End for a limited season at the iconic London Palladium. Hosted by Clive Anderson, the chaotic comedy sees a group of underprepared comedians in an array of challenges suggested by the audience. In a series of entirely improvised sketches and songs to score points, expect an evening of complete silliness. Reuniting the show’s co-creators Dan Patterson and Mark Leveson, who also produced Mock the Week, the improvisational comedy features regular guests Colin Mochrie, Josie Lawrence, Greg Proops and Brad Sherwood, alongside Jeff Davis. Catch this exceptionally funny panel show at the London Palladium for a limited two weeks, opening on June 9th and closing June 19th. Due to audience suggestion, this show may not be suitable for young children. We went last night expecting to be entertained but we didn't expect to laugh so much our jaws ached! Clive Anderson is the perfect host - gently poking fun at himself as well as the guest comedians. The five comedians were completely hilarious and how they come up with such clever improvised songs and sketches is beyond me. I especially liked the part where 2 audience members came on To provide the sound effects for a sketch. We were weeping with laughter! Please can you bring this show to Yorkshire one day? Loved it! !